Seeking ways to squeeze a yield from depleted oil fields, natural gas producers are using a controversial new drilling method called hydraulic fracturing (aka “fracking”)—injecting high-pressure water and toxic chemicals into shale formations such as the Inglewood/Baldwin Hills Oil Fields to force out trapped natural gas. Is this technology safe? What are the regulations to protect our community’s health and safety? Become a part of a fully-informed public! 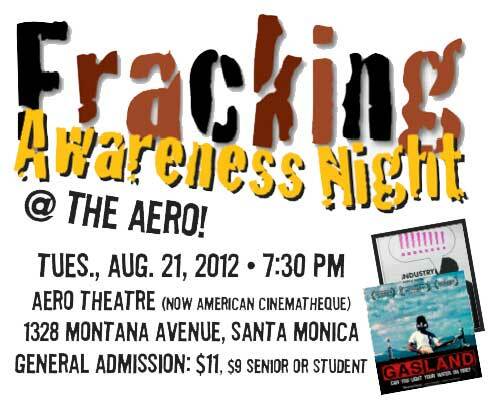 Fracking Awareness Night includes a screening of Josh Fox’s new 2012 “emergency short” The Sky Is Pink plus his Academy Award-nominated 2010 documentary GasLand, followed by a panel discussion of the issues framed in our local context (panelists TBA). Contact TransitionCulverCity@gmail.com for more info. 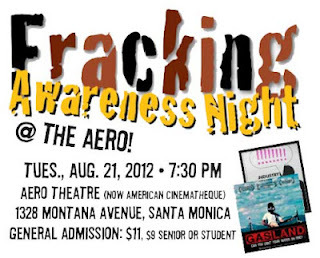 Co-hosted by the Aero and local organizations Transition Culver City, Sierra Club West L.A. Chapter, Frack-Free Culver City, Citizens Coalition for a Safe Community, and national non-profit Food & Water Watch.